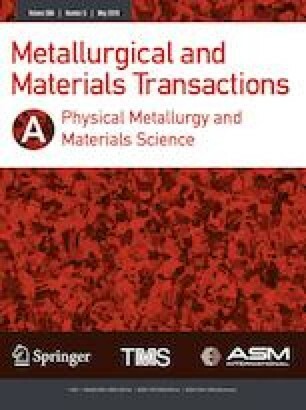 In this study, binary interdiffusivities of bcc titanium-scandium (Ti-Sc) alloys in the temperature range of 1273 K to 1473 K were determined by combining the diffusion couple technique and Boltzmann–Matano method. In addition, the composition-dependent Young’s modulus and hardness of bcc Ti-Sc alloys were obtained using the nanoindentation technique. The results reveal that a small amount of Sc additive can be very beneficial to bio-Ti alloys with good properties. Manuscript submitted October 9, 2018. The financial support from the National Natural Science Foundation for Youth of China (Grant No. 51701083), the Guangdong Provincial Natural Science Foundation for Doctoral Research Project (Grant No. 2017A030310519), the Fundamental Research Funds for the Central Universities (Grant No. 21617340) and the Scientific Research Funds for the Talents and the Innovation Foundation of Jinan University, Guangzhou, China. Wei Li acknowledges support by the Guangdong Province Science and Technology Plan (Grant No. 2017B090903005).